Red Clover (Trifolium pratense) is a common plant that grows in meadows. It is a member of the legume family. Red clover is well known by it’s beautiful purple blossoms. While it can be used internally for coughs, upper respiratory health issues. 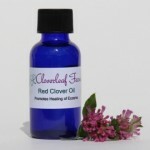 Red Clover oil is a wonderful herb for healing eczema and psoriasis. Red Clover grows is most fields, and to some people’s dismay on their lawns as well. Just like the dandelion, most people just mow down the red clover blossoms without realizing the great potential for healing that it has. For women, red clover can be a wonderful herb. It contains one of the best sources of isoflavones. Isoflavones are a water soluble, natural chemical that act like estrogens in the body, and are found in many plants. These phytoestrogens help replace lost estrogen during menopause. It can be used two ways, as an oil, and as a tea. The isoflavones in red clover have shown to have a therapeutic affect on the body when used during menopause. When rubbed on to the abdominal area daily, the can help the falling estrogen levels in the body, as the oil is easily absorbed into the skin. Stilbene, a natural chemical found in Red Clover. Stilbene is one of the active properties which stimulates estrogen activity, thus helps reduces hot flashes experienced by women during menopause. When applied daily, Red Clover Oil may help reduce the symptoms of hot flashes. A tea is made from the fresh or dried blossoms of the red clover plant. Steep the blossoms in hot water for 10 minutes, and then strain them out. The tea will have a sweet flavor to it, and you may not need any sweetener. If you do, honey, agave or stevia is suggested. An herbal tincture could also be used to treat menopausal symptoms. To dry the blossoms, pick after the morning dew has passed. Give them a rinse to make sure there are no bugs in them. Dry them in the sun, oven or dehydrator. Store them in a paper bag, or glass jar. Storing them in plastic can promote mold. Some studies show that red clover may help to block the enzymes that can lead to the body developing prostate cancer. It surely has absolute limiting effect on the body developing benign prostate hyperplasia sometimes known as BPH. Benign prostate hyperplasia is a non-cancerous enlargement of the prostate gland. For most men BPH is a normal part of aging, and can cause symptoms of interrupted urine flow, or dribbling after urination. It can also cause the man to feel like he has to go even after he just went. Check with your doctor if you have any of these symptoms to rule out more dangerous causes. It’s purifying action on the skin, makes red clover oil a wonderful oil for treating rashes, such as eczema and psoriasis. For psoriasis, it is sometimes combined with other purifying and detoxifying herbs to treat the condition. For those people who have slight cases of eczema, red clover oil alone can help with the itching, and help to clear it from your skin. For those with worse cases, the oil can be combined with other skin healing herbs. Red clover has herbal constituents that act as an anti-inflammatory on the skin, and this will help with the swelling and redness when the eczema flairs up. The oil contains essential vitamins for the skin. Vitamin A is important for healing skin conditions. It also contains vitamin B-complex, is rich in iron and contains volatile oils that help heal skin rashes and inflammatory skin conditions. Red clover oil is a wonderful healing plant for many skin conditions and is safe to use as a herbal remedy for children’s rashes and to treat childhood eczema. 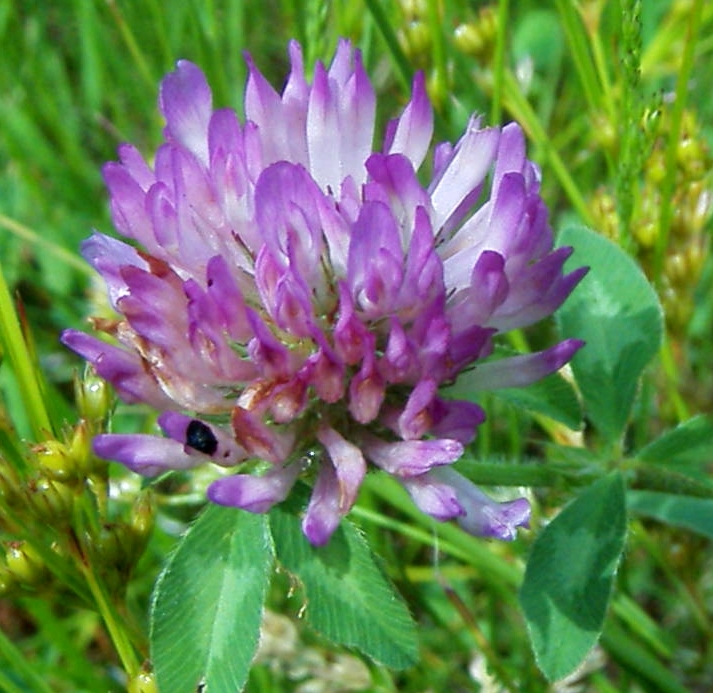 Folk history tells us that red clover, and red clover oil has been used to treat cancers and tumors. Some say that they have cured cancer using red clover oil, or red clover tea. Red clover is part of the Essiac formula of cancer treatment. This great herbal tea formula was discovered by nurse Rene Caisse back in the 1920’s. It is a powerful detoxifier and immune system stimulant for almost 80 years. Essiac tea helps to restore the balance of health naturally, and is a great alternative to drugs and chemo for cancer. When a concentrated Red Clover Oil pack was applied to the tumor site, it encouraged the tumor to grow outward and leave the body. An oil pack is a soft cotton towel soaked in the oil, and then laid over the area. 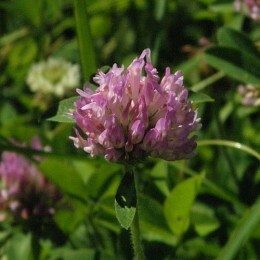 Red Clover Oil is often used as a lymphatic massage oil in an effort to treat or cure a lump or tumor. It is sometimes mixed with other cancer fighting herbs. Scientists at the National Cancer Institute have uncovered some anticancer activity in red clover, including daidzein and genistein activity. Red Clover’s herbal anti-inflammatory healing actions makes red clover one herbs to reach for to put into a massage oil to treat rheumatism. It can be used alone, or with combination of herbs. Red clover contains magnesium and calcium which helps to relax tight muscles and relaxes the nervous system, relieving tension due to stress and anxiety. It is easily absorbed into the system. A red clover tincture could also be used as a liniment rub. A tincture is an herbal medicine that can be used both internally (depending on the herb) and externally. With either the oil, or the liniment, to treat rheumatism, apply to sore area 3-4 times a day while the pain is present. Internally, 10 drops of red clover tincture would be taken 2-4 times a day with either tea, or warm water. It is easily and quickly absorbed into the system, and helps to relieve muscle tension due to stress or anxiety. 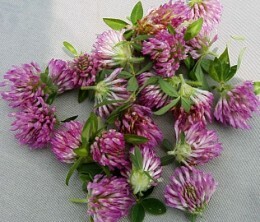 Red clover flowers so versatile and handy to have around the house for treating illness. They are used as an herbal antibiotic, herbal antispasmodic, a blood purifier, an herbal nutritive, and a calming sedative. In the case of colds, it acts as a stimulant (expectorant) for the lungs. It is a vulenary (wound healer), so it is great to have for skin. It also attracts bees, butterflies and other pollinating insects to your garden. Maybe now, you’ll think twice about mowing them down. It is very easy to pick red clover. Find a field of the herb where there has been no chemical or pesticides used. Pop off just the head of the flower. If you get a couple of of the top leaves, that is okay. Pick as many as you will need, and then rinse them gently under cool water to make sure there aren’t any bugs or insects on them. Lay them out to dry in a hot, sunny place. to dry. If you live in a dry environment, you can do this for a couple of days, bringing them in at night. If you live where it is humid, after a day of sun, you can continue the drying process in a dehydrator, or a very low temp oven. If you have an oven with a pilot light, that will work great. After the red clover blossoms are completely dry, store them in a glass jar out of direct light. You can also store them in a paper bag. Plastic bags are not encouraged. Plastic bags don’t breathe, and can trap moisture. All your hard work will be for naught if mold develops. You can use the dried buds to make a wonderful tea. You can also dry the flowers, and grind it into a flour to use for baking muffins, cookies and more. It adds a sweet flavor to any dessert. Red clover should not be used, or ingested by anyone taking blood thinning medication, or other medications that thin the blood. Red clover contains natural coumarins. If you are allergic, it would not be wise to use or ingest red clover for any purpose. Red clover should not be used to treat estrogenic based cancers, as it contains isoflavones which are a natural estrogen. It could make the tumor worse.